Mark Brandi’s Wimmera comes with an impressive pedigree even before it was published. It won a Debut Dagger from the British Crime Writer’s Association while still unpublished. Much like Dodgers, another recent Dagger winner from the US, it is takes the coming of age narrative to a dark place, dealing compassionately with a range of contemporary issues along the way. Wimmera starts with a killer first line: “Dad told us never to cross the highway.” The highway, rattling with giant trucks is clearly a dangerous place to hang out. The prologue, which sets the action firmly in country Victoria, hints at something more dangerous, but all we see at that point is a wheelie bin in the river. So that when the main story opens, focussing on 12 year old Ben and his best mate Fab starting Grade 6 in the late 1980s, a pall hangs over the narrative, darkening even further with the suicide of Ben’s young neighbour. Wimmera is told in three acts. The first focusses on Ben and Fab and has a slow decent into darkness. The second jumps forward to Fab as an adult, still living with his mother, working pushing trolleys in the supermarket managed by one of his school mates, and still living some of the rivalries from his school days even years later. In the third act, events catch up with Fab as past crimes come to the surface. Much like Jane Harper’s recent debut The Dry, Brandi gets the feel of living in a country town right. From what it might have been like to be a twelve year old in 1980s country Victoria – watching McGyver, going yabbying and engaging in schoolyard fights. To a more contemporary vision of life outside the metropolitan areas – Sudanese refugees working menial tasks, the same faces in the same seats wearing a channel in the countertop of the local pub. The mean streets of Melbourne, even the slightly brighter streets of Ballarat, seem along way away. Even with the Royal Commission into Child Sexual Abuse in the media, it is sometimes hard to imagine how these events could have happened in our communities. In Wimmera, Brandi makes it all to easy to understand from the child’s point of view. He turns away from anything confronting or salacious, focussing instead on the power relationships between the children and the adults. Fab and his mother are beaten by his father. Ben deals with this by avoiding it. Ben is groomed by the new neighbour but while he understands something is not right, his parents are blithely unaware of the danger. Both Ben and Fab are damaged, the extent of that damage, the long term consequences and the unsatisfactory response of the law come into sharp focus in the third act. 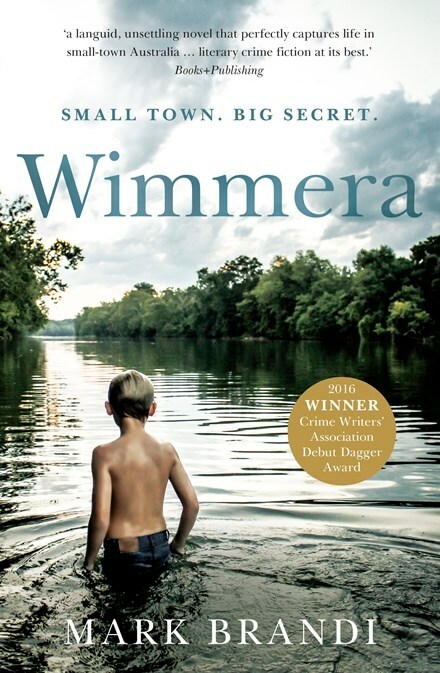 Wimmera joins a group of exciting debut Australian crime authors, many setting their sights beyond the city. But this novel is more than just a gripping crime novel or an atmospheric and well observed view of life in regional Australia. It is also a confronting look at the issue of grooming and child sexual abuse, the full extent of which is still coming to light in Australia.